At Shads, promoting your business is our business. We do more than showcase your logo on unique, premium-quality branded merchandise and corporate apparel. Our team of seasoned professionals works with you to design and deliver a customized product campaign that resonates with your targeted audience. For 50+ years, Shads has created powerful promotional merchandise that maximizes our clients' program impact and drives overall marketing results. Keep your clients and prospects engaged. Keep morale up and turnover down. Keep your branded products on trend. Keep your donors and volunteers feeling appreciated. Keep your branded items available with an online presence 24/7. Shads also makes customer service excellence a top priority on every engagement. Our team of industry innovators collaborates with our clients to take the stress and guesswork out of the promotional product process. From brainstorming cutting-edge concepts and designing original merchandise, to overseeing production deadlines and tracking final delivery, Shads does all the behind-the-scenes heavy lifting to ensure an effortless and convenient client experience, from start to finish. 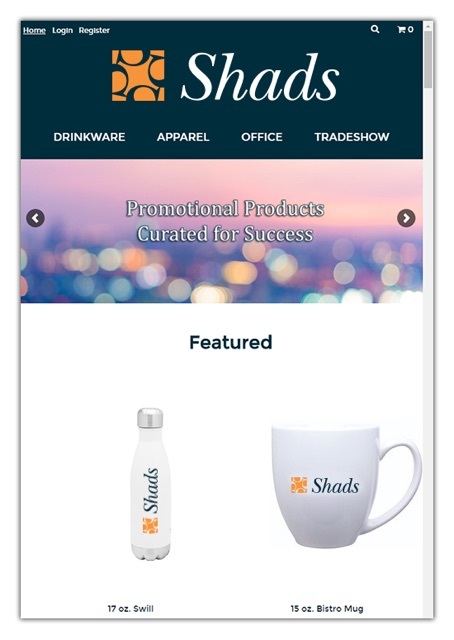 Contact Shads to learn more about our customized merchandise programs or to request a free project quote today. Is an online ordering portal right for you? At Shads we pride ourselves on the expertise of our brand specialists. They are experts at showcasing your brand and ambassadors for your customized marketing campaigns. They can find anything you're looking for and ensure your brand integrity is met without missing a beat. But sometimes, you just want to have the capability to order something quickly and without the need for consultation. You want it to resemble a drive-through. Introducing online order portals!